Anna Laura Hill with boys. Photo courtesy National Orphan Train Complex. Orphan boys in alley. Photo courtesy National Orphan Train Complex. Boys on a train. Photo courtesy National Orphan Train Complex. Placement Ad. Photo courtesy National Orphan Train Complex. 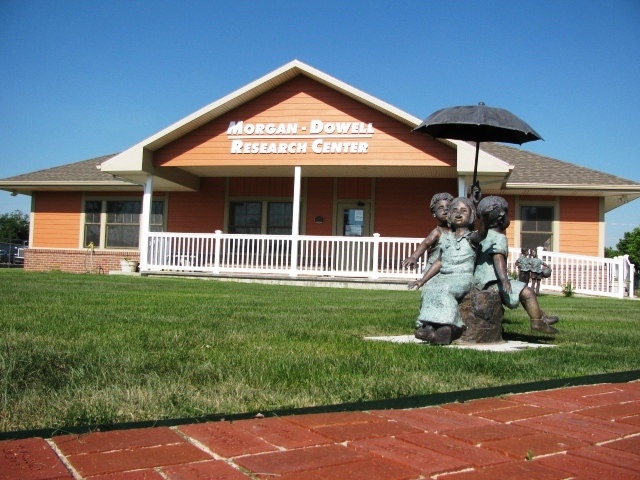 The National Orphan Train Complex is a finalist for the 8 Wonders of Kansas History because it is the only museum in the country that focuses entirely on the Orphan Train Movement. In 1850 roughly 15,000 children were homeless on the streets of New York City. They lived in alleys, under bridges and slept on sewage grates. Those old enough to work sold newspapers, shined shoes, picked rags or labored in dangerous factories and sweat shops. They were left to fend for themselves, to join gangs for protection, and grow up instantly in an environment of filth and violence. Families simply could not afford to support all the children they had. Written in trembling hand, a note pinned to a baby abandoned at an orphanage read, "Take care of Johnny, for God's sake. I cannot." Few cared to help, but some chose to offer these children a chance at a new life. In 1854, what would become known as the Orphan Train Movement began with a group of 46 girls and boys on a train from New York City to rural Dowagiac, Michigan. Between 1854 and 1929, over 200,000 children were placed out through this program. Trains from New York carried children to all 48 continental states and into parts of Canada and about 7,000 were placed in Kansas. It is one of the largest social reform relocation efforts in our nation's history and the beginning of documented foster care in America. The National Orphan Train Complex is a museum and research center dedicated to the Orphan Train Movement, the various institutions that participated, and the children and agents who rode the trains. As the only museum in the country that currently focuses solely on the Orphan Train Movement, the NOTC is unique, not only in Kansas but across the nation. We reach out to riders, descendants and anyone interested in the Orphan Trains to help find relatives and conduct research. Knowing that one in twenty-five Americans is connected to an orphan train rider, our mission is to collect, preserve, interpret, and disseminate knowledge about this movement and create a general awareness about the Orphan Trains. The project to open a national museum in Concordia began with a small group of people dedicated to preserving this history and making the story more accessible to the public. Three states bid to receive the archival collection, but Concordia was selected because of the local committee's commitment to the project, the availability of a museum building, and because this small midwestern town exemplified the type of community preferred by Orphan Train programs. The archival collection was moved here in 2003 and the museum and research center opened in September 2007 after renovations to the 1917 Union Pacific Depot and new construction were complete. Located just north of downtown Concordia, the National Orphan Train Complex is easily accessible from U.S. 81 K-9. Visitors will find life size photographs and information about 19th century New York City and the Orphan Train Movement. They will also see exhibits and displays about riders and their experiences with new families in the West. We strive to provide an honest look at some happy and sad stories; we hope that ultimately, visitors will experience a piece of American history they are unlikely to forget. Open Tuesday-Saturday 10 a.m.-noon and 1-4 p.m.